Nearly all of the SEO techniques used so far have involved visible changes to the web page. 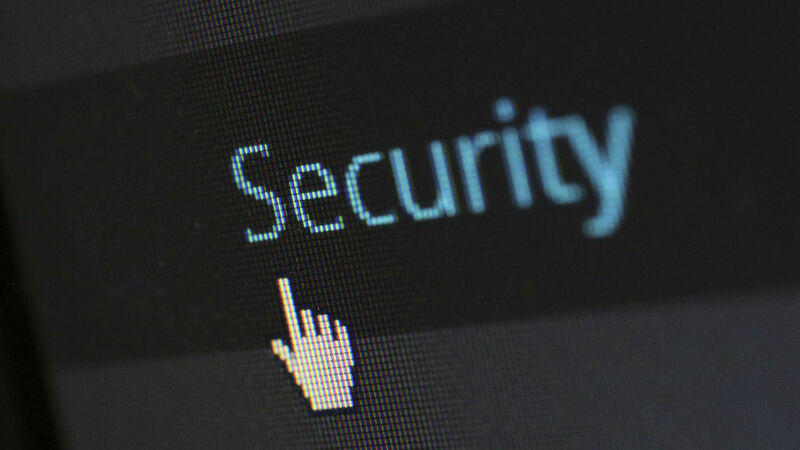 In this section we will look at the invisible codes that can be included in pages to help search engines. The key to on-page SEO is to make it clear what content the web page contains and to make it easy for search engines like googlebot to understand. If a search engine can understand what information is on the page, it can then present it in the the search results to someone looking for it. One of the ways to do this is by including meta tags in the HTML code specifically to tell search engines what the page is about. Meta tags cannot be seen by the visitors to your website and they are invisible. However, search engines can read them and it helps with your website ranking. At one time meta tag information was one of the most important ranking factors and website owners would stuff them full of information. They were abused and they have now lost some of their importance as a ranking factor. Google has specifically said that they don’t help in ranking. However, Google says that about many things, but it is probably to stop people over using certain SEO techniques. It is more than likely that meta tags play a part in the 200 factors that Google considers when ranking search results. Regardless of whether they help ranking, meta tag information is used in the display of search results. For example, titles and descriptions are used for the results page. If you use meta tags sensibly and properly, they help in Google, Bing and Yahoo! search results. There are many meta tags and the more you include, the better it is for SEO. However, some are more important than others and you don’t need to spend half an hour after writing a post filling in meta tags. A few of the most important ones go a long way. Sometimes the title tag is included within discussions of meta tags. Technically speaking it isn’t really a meta tag. It was thoroughly covered in an earlier module looking at titles. This is one of the most important and the meta description is your web page described in around 160 characters. That is about 20 to 25 words. The description may well be used when the page appears in search results and it could also be used when sharing links on social media. For these reasons you need to write it as a sort of sales pitch to people telling them what content is on the page and why they should come and read it. It has keywords like ‘apple pie’ and ‘best apple pie’ which is even better. It also has ‘recipe’ and ‘delicious dessert’. This is a great description for people and it is also good for search engines because it tells them what is on the page. Knowing that, they can include the page in the results when someone searches for apple pie recipes. Make sure that you include the most important words near the start of the meta description. Overly long meta descriptions might have the end chopped off and you don’t to lose anything important. All-in-One SEO WordPress plugin adds these to the bottom of the post editing page. Use them to set the title, meta description and meta keywords tags. Yoast looks different, but works in a similar way and you can add a description to be used by Google and other services. The meta keywords tag contains a list of words or short phrases that are used in the page. It is so easy for webmasters to stuff this with keywords in the hope of improving page ranking that search engines probably don’t pay too much attention to it these days. It was abused, so it’s importance was downgraded. Search engines probably look to the content for keywords and not the keywords list. However, it won’t do any harm to create a short list of keywords. Add about half a dozen that are relevant to the page content. Don’t stuff it with irrelevant keywords or it might have a negative effect. The noindex meta tag tells search engines not to include the page content in their database and to exclude it from search results. The nofollow meta tag tells search engines not to follow the links on the page. These two options are at the bottom of the post edit page in WordPress with All-in-One SEO. If you use another SEO plugin, look for these options at the bottom of the post editing page. If users can register as members of your website, you should exclude the signup and login pages. They do not need to be included in search results. If you have affiliate links to sell products on a web page or if the page is sponsored, the links should be nofollow. Any links where you receive money in return for posting them should be nofollow and setting the meta tag is one way to do this. If you have password protected a web page (there is a setting in WordPress to do this or you can add a membership plugin), then the link should be nofollow. Nofollow can be added to individual links one at a time, but the nofollow meta tag is usually one tick box and so is quicker and easier. It depends on whether you want all links to be nofollow or just one or two. There are some great plugins to help with SEO and Yoast and All-in-One SEO are the two most popular, but there are others. Both of these do a similar job and it is down to personal preference which one you use. Here are some important settings in All-in-One SEO. If you use a different plugin, find the plugin in the sidebar and check the settings. It will have similar features. Select All-in-One SEO in the sidebar and then click General settings. Scroll down the page and find this section. All-in-One SEO includes these to set the meta tag description, keywords and title for the home page. Here you can enter the title for the home page of your website, the meta description for the home page, and the meta keywords. Make sure all of these are completed with useful information for search engines. 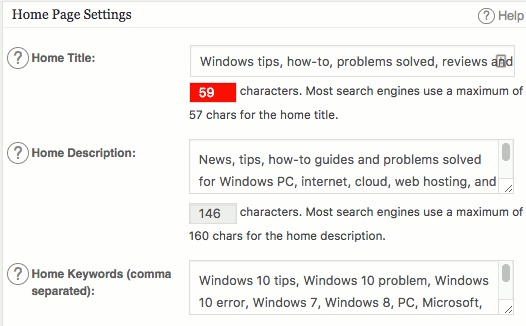 The title should be around 60 characters, the description is 160 characters, and the keywords is unlimited, but keep it short and don’t stuff it with irrelevant keywords hoping they will trick search engines into indexing your site. There is a box in All-in-One SEO general settings to enter your Google+ home page. It sets an author meta tag and this tells search engines who is responsible for the web pages. It isn’t as important as it once was, but it may help and it only takes a minute to set it up. Enter the URL and it is used with every post. Set the author for posts using All-in-One SEO. It’s in the settings. There are additional meta tags that can be added to pages and these are called Open Graph or Facebook Open Graph. They perform similar tasks to the standard meta tags and they provide extra information about the contents of the page. Any search engine can read them, but they were created by Facebook to make sharing your content easier. Jetpack is a popular plugin and it is from the creators of WordPress. 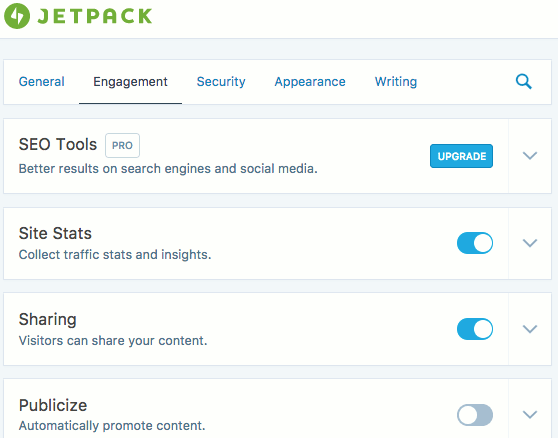 When Jetpack is installed and enabled, and either the Sharing or Publicize modules are enabled, Open Graph tags are automatically inserted into pages. Enable either the Sharing or Publicize modules in Jetpack to include Open Graph meta tags. You don’t need to do anything to add Open Graph tags and you don’t see them. They are hidden in the code. If you don’t have Jetpack installed, click Plugins in the WordPress sidebar. Click Add New and enter ‘Jetpack‘ into the search box in the top right corner. You probably won’t even need to search for it because it is often one of the featured plugins near the top of the page. Return to Plugins in the sidebar, find Jetpack and click the Activate link. Jetpack appears in the sidebar near the top, just under Dashboard. Click it, click Settings, then Engagement. Enable Sharing or Publicize, or both.